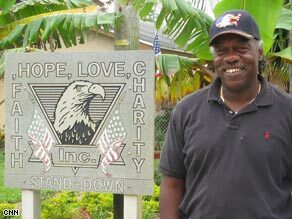 Following a faint trail through a dense patch of woods in Florida’s Palm Beach County, Roy Foster is a man on a mission. Foster, 53, is searching for homeless veterans — and he knows where to look. Whether in a vacant lot behind a supermarket or a small clearing off the highway, homeless vets aren’t that hard to find: One in three homeless adults has served in the military, and more than 150,000 veterans nationwide are homeless on any given night, according to the Veterans Administration. Working with the sheriff’s homeless outreach unit, Foster finds vets camped in tents or makeshift lean-tos, where he delivers a message: There’s help for you if you want it. “For our heroes to be living in [these] conditions, it’s totally unacceptable,” said Foster. Since 2000, approximately 900 veterans have found life-changing help at Foster’s facility, Stand Down House. Named for the military command that gives troops time to rest after arduous duty, the program provides homeless male vets food, shelter and a safe place to recover, as well as the tools to conquer their personal problems. “The idea is that they can relax now; we’ll take care of them,” Foster said. Foster’s motivation to help these men is personal: He used to be one of them. Born in rural Georgia, he joined the Army right after high school. During his six years in the military, he began drinking and experimenting with drugs. He was an alcoholic by the time he left the Army in 1980, and his drinking and drug use escalated as he struggled to adjust to civilian life. He spent the next decade battling his addictions, and at his lowest, he slept in flophouses or on the streets. “I was pretty much out of control,” Foster said. “I felt hopeless, helpless, ashamed and inadequate.” While struggling to get clean, Foster had difficulty finding a program that accepted veterans and provided the recovery services he needed, he said. The experience inspired him to design a program specifically for his brothers-in-arms. “That’s when the commitment in my heart was born,” Foster said.